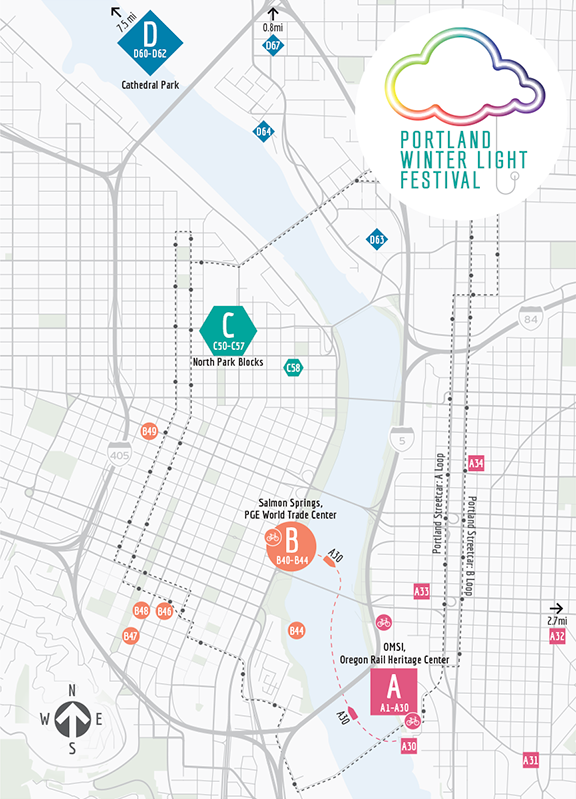 Mayer/Reed is excited to announce our first light installation at the Portland Winter Light Festival! Kinetic De Light is a dynamic 40-foot display of hundreds of skateboard wheels that playfully respond to visitors. A touch of the hand spins light from one wheel to the next, creating streaks of light that fade like comets. Randomness and patterns emerge from the ebb and flow of users’ interactions. Come spin some light with us! Bundle up and find us on the esplanade just south of Tilikum Crossing Bridge by the Portland Opera. #31 on the map. Mayer/Reed is an active supporter of the festival which is set to brighten our city and our spirits February 7-9, 2019. The free outdoor festival enlivens the dark winter nights with illuminated, interactive art installations, vibrant performances and spectacular fire sculptures. The Portland Winter Light Festival is on! In its third year, the illuminated displays and performances have expanded to infuse light, color, and imagination into several locations around the city. As a “Dazzling Sponsor,” Mayer/Reed helped the festival strategize how to communicate that events reach from Cathedral Park to OMSI and created festival maps to show locations of the activity hubs. The Portland Winter Light Festival is free and open to everyone February 1-3, so get out and add some sparkle to your night. We’re looking forward to the upcoming ASLA Annual Meeting in Los Angeles October 20-23. Come learn about the complex planning and design of Portland’s multimodal Orange Line, presented by Carol Mayer-Reed, Bob Hastings (TriMet), Jean Senechal Biggs (DKS Associates) and moderator Brian McCarter (ZGF) in a Friday education session. See you in LA!